I've been trying to write this post for four days, but we've been busy. You know, learning to read the newspaper, pulling all the cushions off the sofa and jumping on them, those sorts of things. Now there's just way too much to share, too many pictures to show, so I'm going to have to pace myself and stick with the original post. But first I just want to whine about the fact that I am really dying this year without a sewing machine. Mine is broken, thanks to a nasty attempt at sewing with knits. The machine is not worth the repair that is needed and a new machine is nowhere in the budget right now. And of course, THIS would be the holiday where my children are asking, begging, for the majority of their gifts to be handmade. Little House on the Prairie bonnets. Little House on the Prairie aprons, Little House on The Prairie sleeping caps, dresses….I'm dying, folks. Anyone have a sewing machine they want to rent me for a week?? Ugh. I'm having a hard time with the Christmas shopping this year. Feeling like my children really don't need much, you know? And they aren't asking for a lot either, which is kind refreshing. Will you tell me what you are getting for your children this holiday season? It always gives me ideas and if nothing else, late winter brings several birthdays in this house and I'm always looking for ideas. Do tell, and I promise I'll keep the secret. My original intent with this post was to share a new recipe for Naan and to share my ugly, poorly lit, "Mom can you stop taking pictures of the bread so we can eat?" photograph . I've been on this Naan-kick lately. It tastes so good with everything–soup, stew, salad, pasta. And I'm always buying the painfully expensive package of it at my grocery store. I figured there had to be a way to make it at home. So I went to my Joy of Cooking cookbook which has yet to fail me. And lo and behold (which sounds like something my mom would say), there it was. I even had all the ingredients. It is so simple,turns out so yummy, and is so dangerous. Just what my waistline needs–a simple, easy-to-make white bread. Place a baking stone(wish I had one) or inverted baking sheet (have one) in the oven and preheat to 475 degrees. Roll out each ball of dough into an oval 8-10 inches long and 1/4 inch thick. Brush the tops with melted butter. Add toppings, if desired–poppy seeds, scallions, etc. Place the dough topping side up with as many ovals as will fit without touching directly onto the baking sonte or sheet. Bake until each oval gets puffy and just begins to turn golden 6-7 minutes. Remove from the oven and bake remaining dough. Drizzle over the baked bread, 1T melted butter (optional). Now go forth and bake Naan. I'll catch up more next week. Hi M! I take it you got your technical stuff figured out, I’d love to know your reasoning behind switching, is it better? I guess your loss (of a sewing machine) is our gain, because you’re posting a ton of great recipes these days. We may make your sugar cookies tomorrow if we have time, we’re prepping for an open house on Sunday. What are we thinking? I’ve been meaning to make Naan for a long time. Thanks for the recipe! My first comment on your blog to say – you could borrow mine! but i’m in oregon and i’m pretty sure you’re not. otherwise it’d be all yours. i’ve been knitting this year instead of sewing. Sorry about your sewing machine. 🙁 We are getting our kids a globe for Christmas. $30 at the Discovery Store. We are military. We have friends and family scattered about the world, so now the kids can see where everyone lives. Oh and a few other little things…. “Wrinkle in Time” and some games. Mmmm– that bread sounds great– and deadly. I still have not recovered from the pita recipe on the Farmgirl Fare blog! I was going to answer your question, but my little readers are milling around and peering over my shoulder. Dude. I have an extra machine. It probably won’t get there in time for Christmas but if you can explain to the kiddos, I’ll send it out tomorrow after work…or get the hubby to send it out tomorrow morning. I am totally giggling at the commentary on the recipe…it’s like the “real” Joy of Cooking instead of the airbrushed BHG version, ha ha ha. Sorry about the sewing machine…it’s funny what happens in the craziness, and then you think you won’t miss it, but you do…kind of like my brain. *laughter* Anybody got one of those I could borrow? I agree- my kids don’t need anything either. I tend to stick to activity type presents- legos and building toys. My six year old is getting the long coveted Easy Bake oven. I also found some fantastic pop up books this year on Amazon. I got “The Enchanted Dolls’ House” which looks fantastic. we got miller a wooden kitchen set, a play banjo, rythm sticks and a wooden recorder…oh and i made some felt fruits and veggies. This year: wooden marble maze, Moon in my Room from Discovery store, and an electric guitar (apparently my 4-year-old son’s acoustic guitar is too tame these days). Oh, and a harmonica (he got a new winter coat that had an inside pocket designed for a MP3 player and I told him it was made to hold a harmonica). Last year: tree blocks were a big hit. Have you ever seen them? They’re COOL. 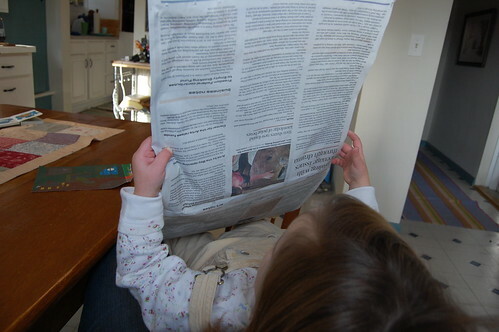 I am lurking regular reader of your blog. My daughter Olive is 2 & 1/2 & we went crazy this year. She asked Santa for a doggie, so I knit her one from this awesome book: http://www.hawthornpress.com/book.php?isbn=9781903458686I also made her barrettes from here: http://angrychicken.typepad.com/angry_chicken/2007/06/this_house_is_w.html & beaded bobby pins from the Christmas Martha Stewart.We also bought her 2 new books (a Jan Brett folk tale & a new Mother Goose collection), as well as a toy train & a food chopping set from Plan Toys. We went crazy. Good luck with the machine – I hope it works out! I loved Little House soooo much. The nan looks good, can’t believe it was in Joy of Cooking. Gift from THE MAN: For 6yo ds: starter guitar, space shuttle mug (we all have our own “special” mug, except for him! ), wooden nesting family dolls. For 4yo dd: red sparkle shoes, this hobby horse http://tinyurl.com/9qhxln, and a soccer ball. From mom and dad, son is getting the 2 cd set from Pa’s Fiddle Project (little house) and I’m making daughter a new baby doll. We were supposed to go see “A Little House Christmas” tonight, and it was canceled – waaaaah!!!! ours are having…packets of seeds and mini propogators, a globe each(they fight over mine), the big 2 are having a starter set for stamp collecting and the littl one is having a ukelele!! 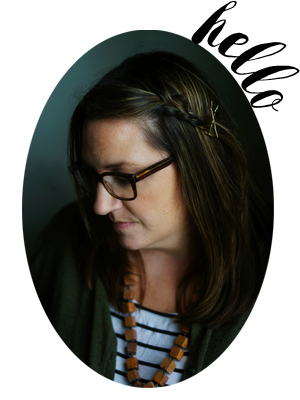 Oh Molly… I wish I could bring my sewing machine to you. I would give it to you and ask to borrow it once in a while! My daughter (6.5) hasn’t really asked for anything this year. The one thing she mentioned was new markers and drawing paper, so she’s getting that for sure! I think part of the reason she doesn’t ask for things is because she rarely gets to watch TV with commercials. The few times she has we are deluged with requests for every toy, snack and whatever she sees. Sears has some pretty good deals on simple Kenmore sewing machines. I have one of their 3/4 machines and I love it. It was my only machine for the longest time and it could do anything! I think we only paid $80 for it. I don’t know if that’s in the budget, but I thought I’d put it out there. Just go to their site and search sewing machines. Otherwise, I can suggest some good books! They always make great presents! Joy of cooking never fails to come through…I used to think..oh joy of cooking…not useful.. We even reverted to their bread recipe lately..Love them. so sorry about your sewing machine. Santa is bringing a playmobile set to m and a lego set to z. We are giving them a wii fit. and they each bought the other a little something. we pool the grandparent money and buy season passes to a theme park. this year it will be busch gardens. We enjoy spending the time together, have learned to spend hardly any money there, and there are no toys added to our house. yay! Yum, naan. I’ve never made it, but I imagine it would be fun to make all the different kinds. I like the garlic kind, and the sweet kinds. Yum, again. I was going to make them each a doll quilt and pillow, but I don’t see it happening. They are pretty imaginative using dishclothes and stuff for that anyway. And they will have plenty as it is! No books this year because former teacher Grandma sent us three giant boxes of them when she retired, so we have PLENTY! My machine just broke last week in the midst of holiday present making. I feel your pain! My daughter loves the game Zingo. We play that thing for hours on end. It’s a lot of fun! I think we found it at Barnes and Noble but I think Target has it too. We got Nissa some craft supplies/sets and some gym shoes and clothes so she can ‘exercise’ like us. And a baby doll….she loves that! This is the year of plastic toys with years of mileage on them. We’re getting Josiah (almost 6) Star Wars Lego set that must include Anakin, R2D2 and lightsaber. Scored one for under $20 at Target, now they’re over $70 on Amazon. Legos have been so great for him lately! Eden (3.5) is getting a Playmobil fold and go dollhouse. She LOVES little people, and this dollhouse was affordable and not huge. Playmobil is wonderful, we have the Nativity and the figurines hardly ever stay in one place. WE also got it at a great price (under $40) before it got to be $200!!! on Amazon. I’ve also got a hip little hoodie for my son (he loves them) and some play shoes (plastic clop-cloppy heels) for Eden. Seeing as I’m having a baby any day now, I left the handmade gifts up to my Mom this year. Next year I’ll wear myself out I’m sure. Sorry to hear about your sewing machine.Have you tried freecycle.org?I got mine from a fellow freecycler, and near us, they are always listed. My kids are each getting a pair of home made PJs, several books, and a toy. My son asked for a Barbie Mariposa and my Daughter is getting a pillow and quilt for her doll. Good luck finding a sewing machine. dollhouse for the little. bike for the big. lots of books and art supplies.xo. Wow this is great! 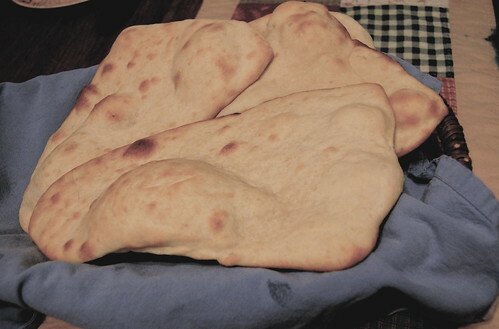 I have been looking for a recipe to make naan at home, and this looks wonderfull!